How Many Lego Indiana Jones Sets Are There? 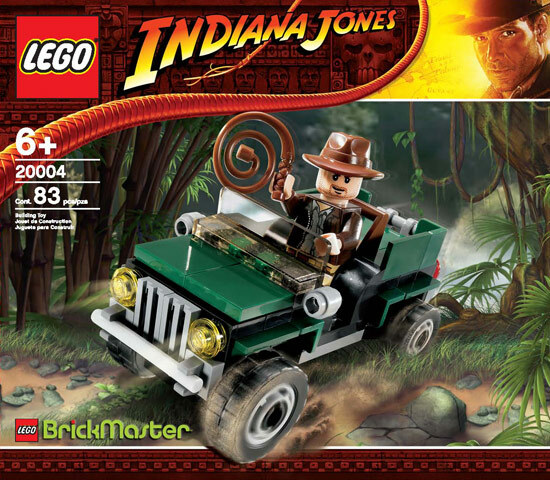 In 2007 Lego announced that they had acquired the license to produce Lego Indiana Jones based sets in , following the success of their Star Wars based sets. 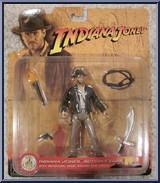 The first three of these based on the first movie, Raiders of the Lost Ark, were released early in 2008, with a further four sets based on the Kingdom of the Crystal Skull released later that year. 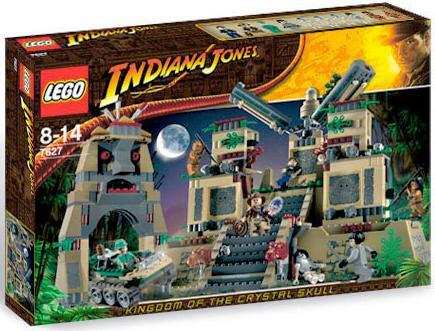 This Lego Indiana Jones set was one of the biggest released and featured the famous boulder scene from the opening of Raiders. 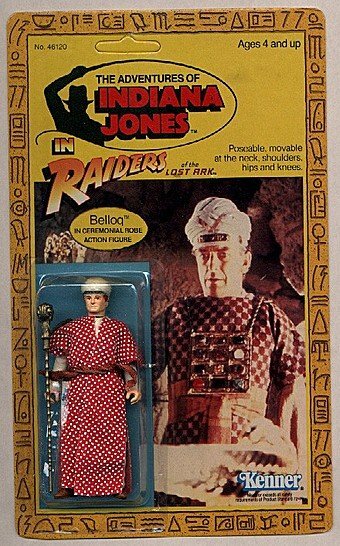 The set measured approx 53cm and included several booby traps from the movie as well as a Indiana Jones mini-figure and also René Belloq and Satipo. 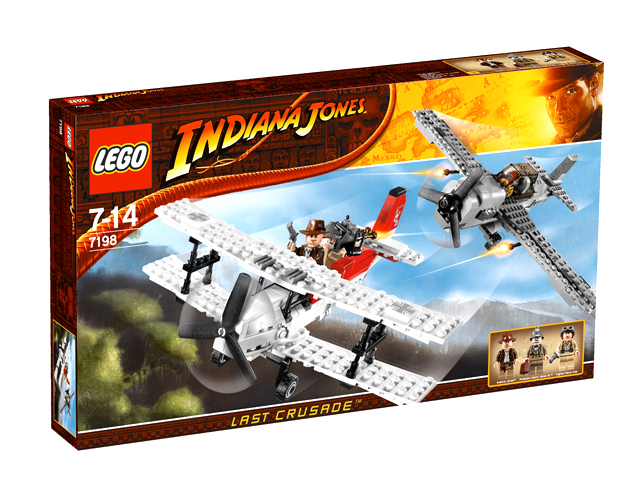 Later, Lego Indiana Jones sets also included Pilot Jock and his seaplane, which were considered important parts to the set. Jock's airplane has the registration number "OBI-CPO", which could be referring to Obi-Wan Kenobi and C-3PO, since Harrison Ford is the actor for both Indiana Jones and Han Solo. Indiana Jones with hat, whip and shoulder bag, Belloq, Satipo and pilot minifigures! a 6" (15cm) long plane with snake inside, just like the scene from the movie! Features and details include skull rocks, bat, spider, spiderweb, skeletons, gold coins and more! Temple measures a total of 21" (53cm) long! 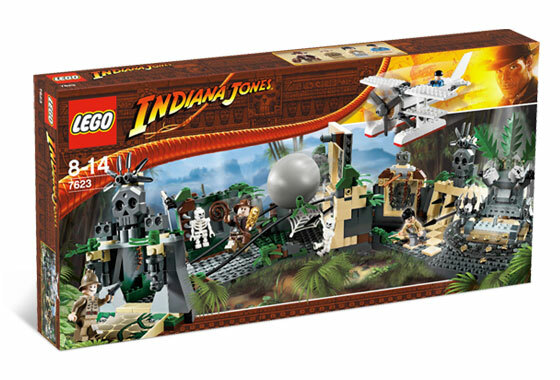 This set was also based on ROTLA but was a much smaller set featuring a snake filled tomb that Indy has to escape from. It also contains the hieroglyph depicting C-3PO and R2-D2 from Star Wars, which was a reference inserted into the Movie by George Lucas. In the movie scenes the hieroglyphics are on the Well of Souls walls. Indiana Jones with hat, whip and bag, and Marion minifigures! snakes that drop from the ceiling! Tomb stands 5½" (14cm) high! This was the third set from the ROTLA movie and features the chase scene when Indiana Jones is chasing the German truck on horseback. 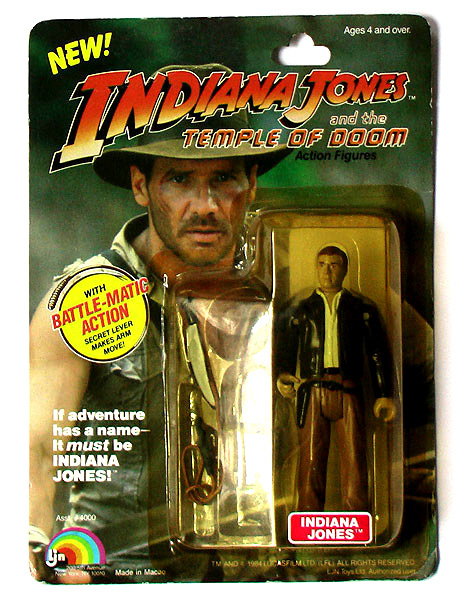 Includes Indiana Jones™ with hat, whip and bag, guards and a horse! Treasure chest is being transported inside the covered truck! Truck measures 6" (15cm) long! Super cool dual engine Flying Wing airplane and Tanker Truck included! Opening cockpit on plane and truck. Find the Ark of the Covenant in the hidden cargo hold! 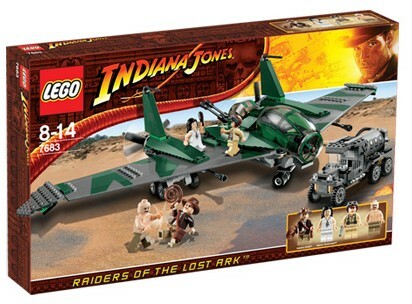 Includes Indiana Jones, Marion Ravenwood™, Pilot and Airplane Mechanic Minifigures! Plane measures 7.5" (19 cm) in length and has a 23" (58cm) wingspan! 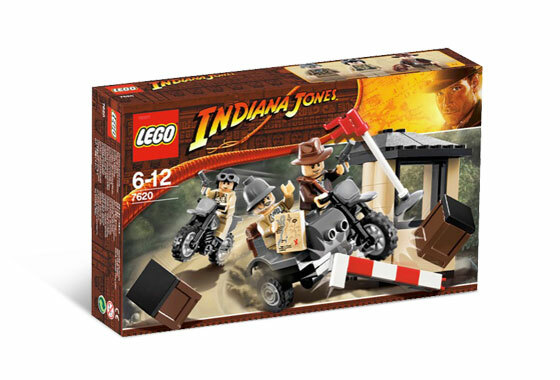 This Lego Indiana Jones set was based on the scene when Indiana Jones and Marion are ambushed by a swordsman and a club-wielding warrior in an Egyptian bazaar and have to fight their way out to escape. 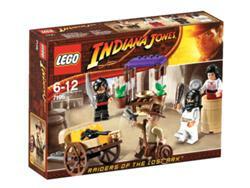 4 minifigures: Indiana Jones, Marion Ravenwood, Cairo Swordsman and Cairo Warrior! a sword, club, frying pan, green apple, golden dish, barrel and weapons! a wagon measuring 3½ inches (8.9cm) long; Market stall measures up 2 inches (5.1cm) L x 1¼ inches (3.2cm) W x 2½ inches (6.4cm) H! This scene is taken from the second movie and features the scene when Indiana Jones, Willie Scott and Short Round speed away from the scene in Indy’s car through the streets of Shaghai. 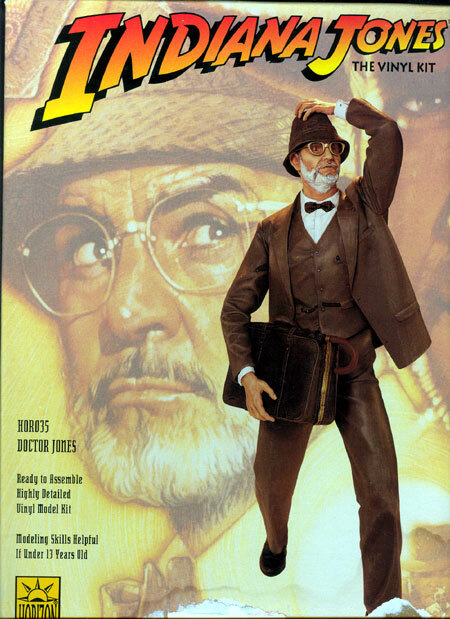 At Toyfair the boxart showed Short Round with Mutt Williams' head and Jock's torso, Willie Scott with Marion Ravenwood's head and a Royal Guard torso and the Shanghai gangsters with the heads of Bruce Wayne and Doc Ock. cool period vehicles including Indy’s Car and the gangsters black sedan! Indiana Jones in a white tuxedo, Willie, Short Round and two gangster minifigures! Vehicles measure 5.5" (14cm) long! 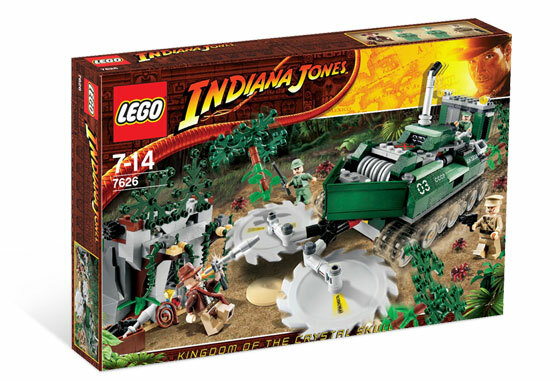 This Lego Indiana Jones recreates the famous wild mine cart chase in the underground Temple! At Toyfair the box art showed Short Round with Bruce Wayne's 2006 head and a City torso, Willie Scott with Marion Ravenwood's head and torso and Mola Ram and the thugees with Skeleton Warrior heads and City torsos. 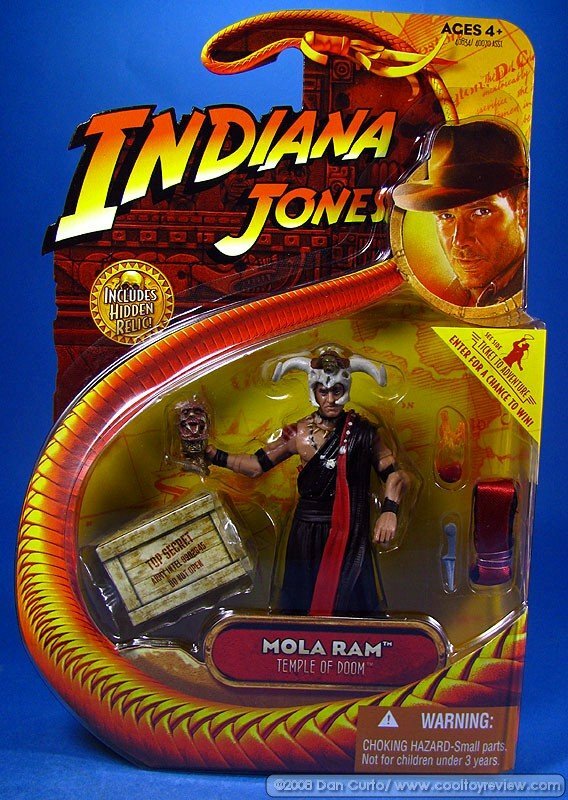 6 minifigures: Indiana Jones, Short Round, Willie, Mola Ram, 2 Temple guards! Features 2 rail carts, trapdoor in the temple, barrier and stone traps on the track, and a sword trap under the temple! Combined length of Temple and mine track is 37" (94cm) long! In this scene from The Last Crusade with Sean Connery playing Indy’s father they have found the treasure map that leads to the Holy Grail. But a guard is hot on their trail and the motorcycle chase is on! Indiana Jones with hat, whip and bag, Professor Henry Jones, and guard! Indiana Jones' motorbike with sidecar that detaches! Gate moves up and down! 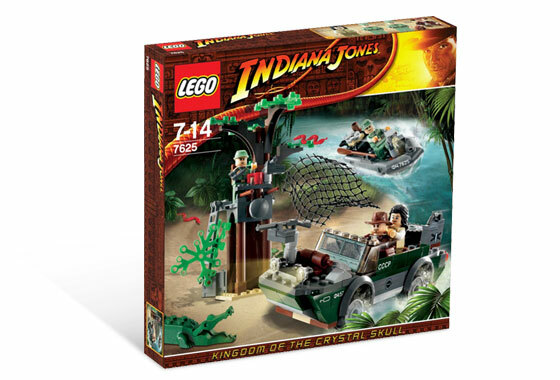 This Lego Indiana Jones set recreates the scene when Indy and Elsa are chased by a secret order of guardians sworn to prevent the Grail from being discovered as they escape through the canals of Venice! 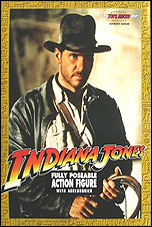 On the prototype box art, Indy has an Imperial Officer torso, Elsa has Marion Ravenwood's torso and Princess Leia's head and the Knight of The Cruciform Sword and Kazim both have Galen Marek's head. 4 minifigures: Indiana Jones, Dr. Elsa Schneider and 2 Grail Guardian figures! Features a collapsing bridge, breakable boat bottom, exploding motor, and secret manhole hiding place! Each boat measures 6¾ inches (17.1cm) long! In this scene Indy and his father are escaping from a zeppelin in a stolen biplane, they are pursued through the air by an enemy fighter plane. Professor Jones accidentally shoots off their own tailfin and causes a crash landing, but some clever maneuvers help them knock off both of the fighter plane’s wings! 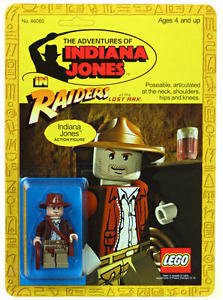 3 minifigures: Indiana Jones, Professor Henry Jones Sr. and fighter plane pilot! each airplane equipped with flick missiles! fighter plane has wings that detach and biplane has a break-off tailfin! biplane measures 8½ inches (21.6cm) long with a 9 inch (22.9cm) wingspan! fighter plane measures 10½ inches (26.7cm) long and has a 11½ inch (29.2cm) wingspan! 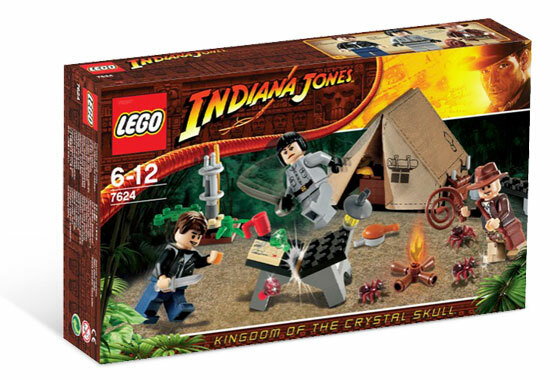 This Lego Indiana Jones set features the scene from the last movie when Indy and Mutt are at the ancient and forbidden Chauchilla Cemetery where they have to fight off the graveyard’s skull-faced guardians, find the secret passage in the tomb, and discover the Conquistador’s skeleton and the mysterious Crystal Skull. 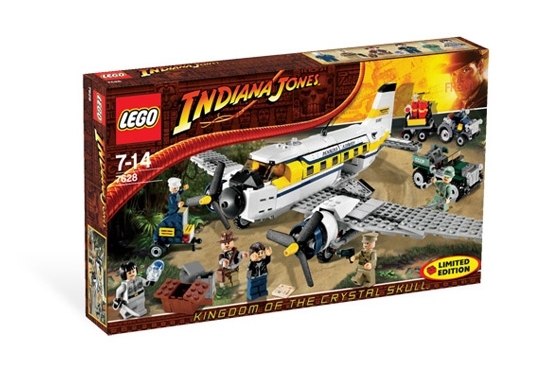 5 minifigures: Indiana Jones, Mutt Williams, 1 skeleton and 2 cemetery warriors! 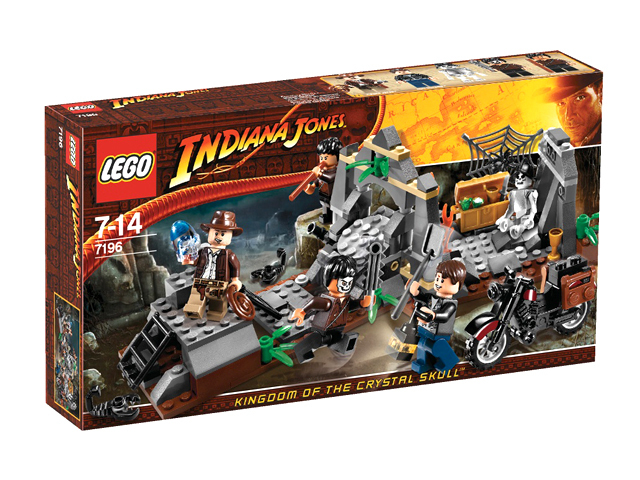 Loads of accessories including The Crystal Skull, weapons, goblets, Indy's whip, scorpion, motorbike and more! Cemetery measures 9½ inches (24.1cm) long by 4 inches (10.2cm) wide! In this box set Indiana Jones and Mutt face off against the sword-wielding Irina Spalko, the leader of the Russians, who has been pursuing them. fully-equipped campsite with tent, campfire, table and ants! 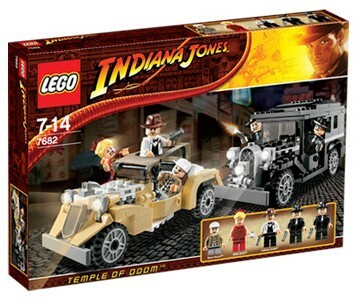 Indiana Jones with hat, whip and bag, Mutt Williams and Irina Spalko minifigures! 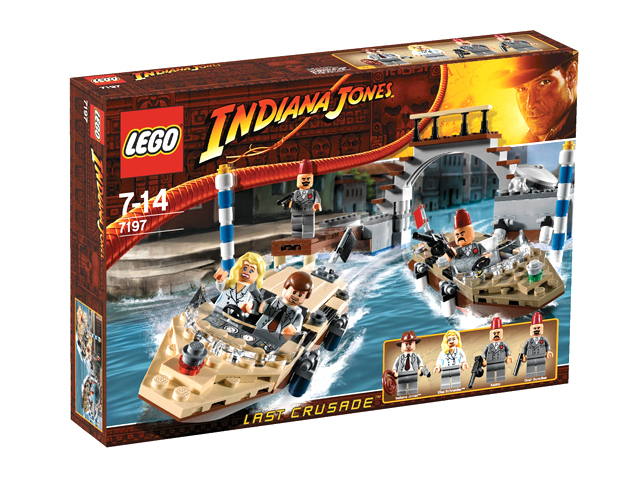 This set recreates the daring chase when Indiana Jones and his team attempt a river escape in an amphibious vehicle built to travel on both water and land but the soldiers are in hot pursuit. 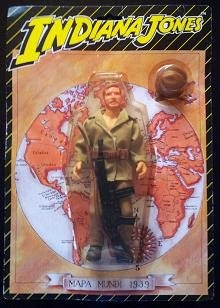 Indiana Jones with hat, whip and bag, Marion Ravenwood and two Russian Guard minifigures! Drop the net from the tree! Vehicle measures 6" (15cm) long! Indiana Jones is trapped in a makeshift hideout while the mighty Jungle Cutter comes crashing through the trees, chopping down everything in its path with its giant spinning blades. Indiana Jones with hat, whip and bag, Colonel Dovchenko™ and 2 Russian Guard™ minifigures, plus ants and break-apart trees! 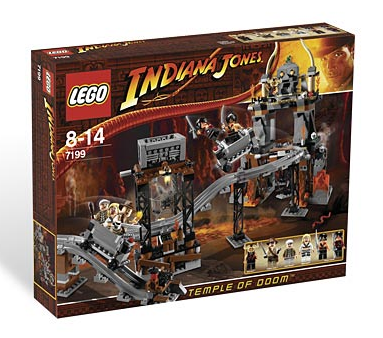 In this Lego Indiana Jones set from the Kingdom of the Crystal Skull, Indy gets past Irina Spalko, and then survive the temple’s collapsing stairs, firing spears, hostile warriors, and many other tricks and traps. Indiana Jones, Mutt Williams™, Irina Spalko™, Russian Guard, 2 Ughs Warriors™, armored skeleton and 3 Akator Skeleton™ minifigures! Temple features moving staircases, hidden rooms, flying objects and lots of cool details! Temple stands 10" (25cm) high! Base measures 15" x 10"! Indiana Jones and Mutt have been captured by Irina Spalko and her henchmen and are tTaken to a secret South American airport where they must use their wits to escape. Indiana Jones with hat, whip and bag, Mutt Williams™ and Irina Spalko™, Colonel Dovchenko™, pilot and guard minifigures! plane, runway tractor and trolley, stairs to access the plane, plus Russian truck and a case that holds the crystal skull! Plane features working landing gear, propellers that spin and side compartments that open! 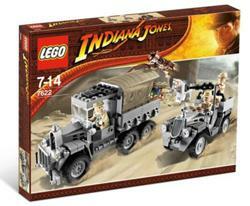 This Lego Indiana Jones small box set consisted of a small green jeep and an Indiana Jones minifigure with a whip. It was a BrickMaster exclusive set for the September/October 2008 magazine.